Student success pathways are rarely linear. They are filled with twists and turns, forks in the road, dead-ends, and any other commuting metaphors you can think of. However, by checking in with students at key moments in their higher ed journey, we can increase the likelihood of their success. Once divided into more manageable time-frames, we may begin to determine what types of engagements would most benefit a student, and at what time. For example, the enrolment department sending a welcome message in June during the orientation period would constitute as a key touch point. One you’ve determined all of the engagements you think would benefit a student during orientation, first year, etc., it is important to determine which touch points are “critical” versus those that are “optional.” Our welcome email, for example, would be classified as a “critical” touch-point, since it is the first real communication that a student will have with the institution and will begin the process of integrating them into the campus community. An example of an “optional” touch-point during orientation might be an invitation to a free outdoor concert on the quad. While this is a great way to get students participating in campus-life, they wouldn’t suffer academically if they did not attend this event. Proactive engagements: Any engagement that promotes student success. Reactive engagements: Any intervention that is a response to a specific trigger or event. Going back to our orientation welcome email example, because it acts to encourage student success without any specific prompt, it would be categorized as a "proactive" engagement. 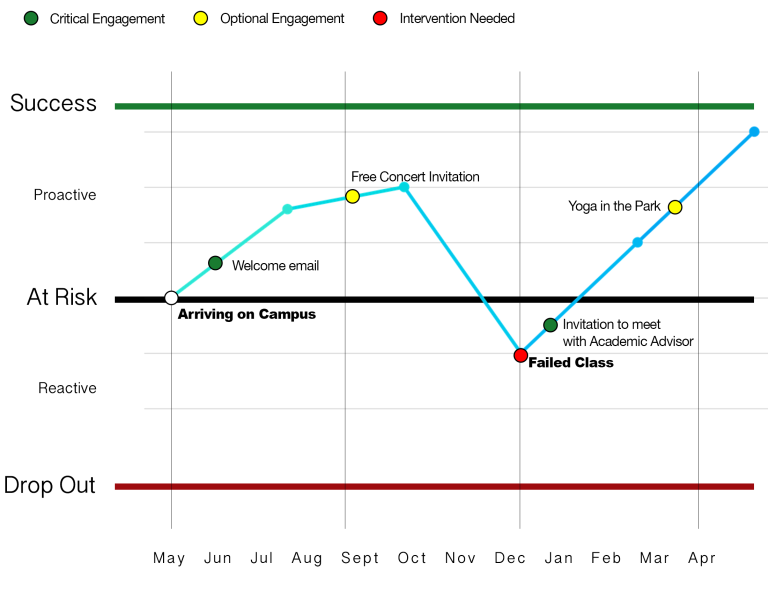 An example of a "reactive" engagement might be an invitation to meet with an academic advisor if the institution notices a student’s grades beginning to decline. Download the worksheet here and fill in your own engagement touch points. Once you've filled out your sheet, plot your touch points on the graph provided in the document. To learn more about helping track and assess student success on your campus, schedule a consult with a student success specialist here.